Sodium iodide (chemical formula NaI) is the salt of sodium and iodide. It is a white, crystalline solid that is used mainly as a nutritional supplement and in organic chemistry. It is produced industrially by acidic iodides and sodium hydroxide. Sodium iodide, as well as potassium iodide, is commonly used to treat and prevent iodine deficiency. Iodized table salt contains one part sodium or potassium iodide to 100,000 parts of sodium chloride. 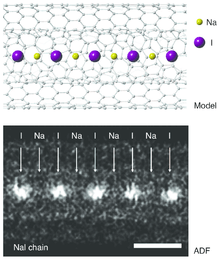 Monatomic NaI chains grown inside double-wall carbon nanotubes. Some radioactive iodide salts of sodium, including [125I]NaI and [131I]NaI, have radiopharmaceutical uses, such as in the treatment of thyroid cancer and hyperthyroidism or as radiolabeling tracers in imaging (see Isotopes of iodine > Radioiodines I-123, I-124, I-125, and I-131 in medicine and biology). Sodium iodide activated with thallium, NaI(Tl), when subjected to ionizing radiation, emits photons (i.e., scintillate) and is used in scintillation detectors, traditionally in nuclear medicine, geophysics, nuclear physics, and environmental measurements. 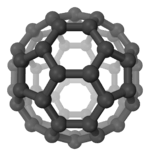 NaI(Tl) is the most widely used scintillation material. The crystals are usually coupled with a photomultiplier tube, in a hermetically sealed assembly, as sodium iodide is hygroscopic. Fine-tuning of some parameters (i.e., radiation hardness, afterglow, transparency) can be achieved by varying the conditions of the crystal growth. Crystals with a higher level of doping are used in X-ray detectors with high spectrometric quality. Sodium iodide can be used both as single crystals and as polycrystals for this purpose. The wavelength of maximum emission is 415 nm. ↑ Seidell, Atherton (1919). Solubilities of inorganic and organic compounds c. 2. D. Van Nostrand Company. p. 655. 1 2 Lyday, Phyllis A. (2005) "Iodine and Iodine Compounds", pp. 382–390 in Ullmann's Encyclopedia of Industrial Chemistry, Vol. A14, Wiley-VCH, Weinheim, ISBN 978-3-527-30673-2 doi:10.1002/14356007.a14_381. ↑ Senga, Ryosuke; Suenaga, Kazu (2015). "Single-atom electron energy loss spectroscopy of light elements". Nature Communications. 6: 7943. doi:10.1038/ncomms8943. PMC 4532884 . PMID 26228378. ↑ De Namor, Angela F. Danil; Traboulssi, Rafic; Salazar, Franz Fernández; De Acosta, Vilma Dianderas; De Vizcardo, Yboni Fernández; Portugal, Jaime Munoz (1989). "Transfer and partition free energies of 1 : 1 electrolytes in the water–dichloromethane solvent system at 298.15 K". Journal of the Chemical Society, Faraday Transactions 1: Physical Chemistry in Condensed Phases. 85 (9): 2705. doi:10.1039/F19898502705.